Last weekend my sisters and I spent the afternoon at the spa for a little bridal party getaway in the city. This was a first for us, and definitely not a last. The women-only Body Blitz Spa has two locations in Toronto, one at 71 Adelaide St. West and the other at 497 King St. East. 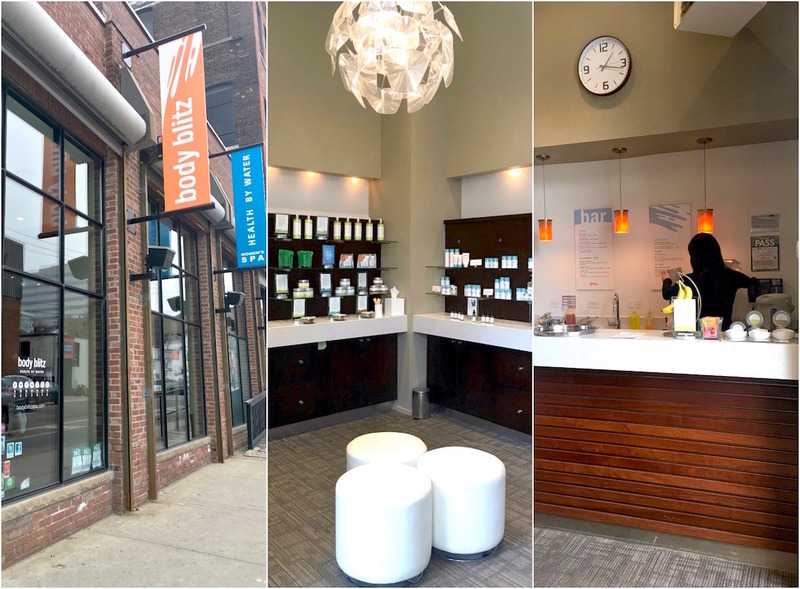 We went to the Adelaide St West location, since the East location couldn't accommodate all of our treatments at the same time. We chose to take part in the "Body Blitz Spa Day Extravaganza" to make the most out of the baths and body treatments that afternoon. 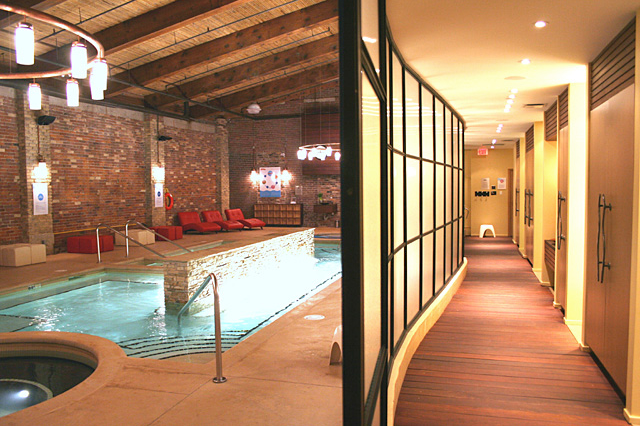 No phones are allowed inside the spa area, since clothing is optional. Besides, we all need a little digital detox every now and then. The overall ambiance was really cool, and totally comfortable. They have a really nice juice bar feature with some delicious smoothies and teas that they will deliver to the pool area. We enjoyed the Vitamin D smoothie, which was made with milk, vanilla, banana, cocoa powder, honey, nutmeg and vitamin D drops. Yum! 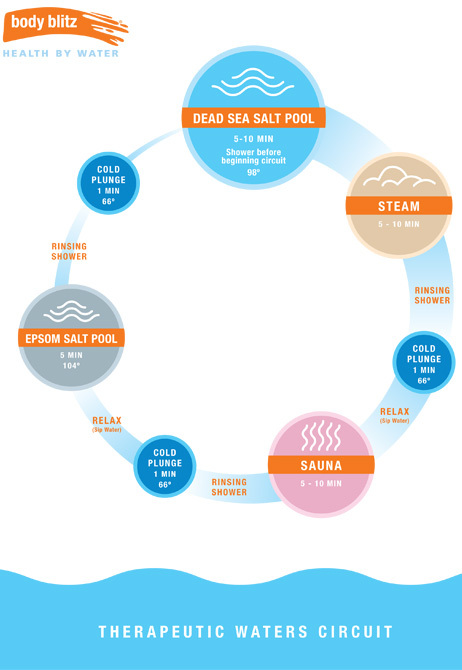 Dead Sea salt helps promote pain relief, helps improve joint mobility, gives relief from skin and rheumatic disorders, aids in the elimination of toxins and helps replenish the body with vital nutrients essential to the human body. The body blitz steam room, with 100% humidity, is perfect for relaxation, increasing circulation, cleansing and toning the skin and is beneficial for respiratory disorders and rheumatic pain. Eucalyptus oil is added to revitalize the senses. Plunge into the fresh waters to cool the body, increase the body's energy level and to tighten pores. Alternating between hot and cold is recommended to keep your body temperature and heart rate at a healthy level. This new-generation sauna provokes a sweating effect up to 3 times superior to traditional saunas, creating an in-depth detoxification of the entire body. Infrared waves have the ability to help evacuate deeply-lodged toxins that are often at the heart of many of our health and beauty problems. Epsom salt helps relieve muscle pain, reduce inflammation as well as helping muscles and nerves to function properly. The high magnesium content improves sleep and concentration and helps to regulate over 325 enzymes in the body. Entrance to the waters only is $50-$60 depending on the day, and there is a detailed list of treatments available on the spa menu here. For the second part of our afternoon, we had our full-body treatments. My sisters chose the Deluxe Moroccan spice body glow (Hydrates and revitalizes) and I chose the Deluxe sweet ginger body glow (Great for dry or sensitive skin). The entire spa duration is set for 3.5 hours, and costs $210. I was so impressed by the service at Body Blitz overall - I've never experienced anything like it before. They provide you with a disposable thong to wear during the body treatment, and the entire thing is very much like a fancy car wash, for the bod! Complete with a hose, tiled walls and overhead heat lamps, I got washed, scrubbed, and moisturized like never before. The treatment almost felt too harsh for my sensitive skin at times, but not to the point where I was very uncomfortable. The intensity of the entire scrub/massage process was surprising - we definitely got our money's worth and I was happy with the less-than-glamorous ambiance. So would I go back to the spa? Yes! Especially for another occasion like this. Body Blitz Spa provides group booking deals for parties of five or more, and their entire facility is very clean and inviting. I might consider only going for the baths in the future, but don't shy away from the treatments - you won't be disappointed. I've never done anything like it, or even heard of anything like it before, but I'd LOVE to try the circuit it sounds amazing.